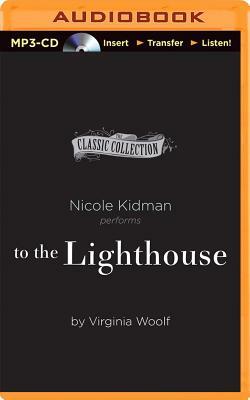 To the Lighthouse is Virginia Woolf's arresting analysis of domestic family life, centering on the Ramsays and their visits to the Isle of Skye in Scotland in the early 1900s. Nicole Kidman (Moulin Rouge, Eyes Wide Shut), who won an Oscar for her portrayal of Woolf in the film adaptation of Michael Cunningham's Pulitzer Prize-winning novel The Hours, brings the impressionistic prose of this classic to vibrant life. Split into three parts, the story observes Mrs. Ramsay, Mr. Ramsay, and their children at their vacation house on the Isle of Skye. While the novel follows seemingly trivial events between the family members, the plot takes a backseat to philosophical introspection, which gave the novel its fame as an icon of modernist literature. The Ramsays' quest to recapture meaning creates a powerful allegory of man's impermanent battle with the tangible world. To the Lighthouse is part of Audible's A-List Collection, featuring the world's most celebrated actors narrating distinguished works of literature that each star helped select.